Nicolas Kyvernitis Electronics Enterprises (NMK), a distributor of Clear-Com in the Middle East has recently supplied Media Mania with the Eclipse HX Delta. 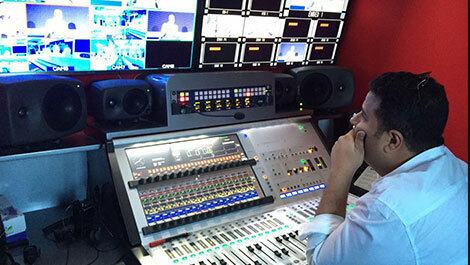 Media Mania, production house, broadcaster and system integrator with over 15 years’ experience, is one stop shop offering wide services and crew hiring to their clients in the Middle East. The company has been already using Clear-Com’s PICO V series panel with the rotary options in all their OB vans and based on their satisfaction with the brand they have opted for HX-Delta for several reasons including its redundancy, flexibility, readability and four cards modular adaptive which is adaptable and configurable to the needs of their job. “We at Media Mania always look for the best products at the market in order to serve our clients at the top quality level, and there’s no room for mistake or failure in our line of OB van and broadcasting work, where the communication has the highest importance. Therefore we need to select reliable and trusted products combining product’s quality, price and features. As respected system integrator we provide long-lasting products and services to our clients and the Eclipse HX Delta in particular lines up with our aim and work ethic,” explained Roland Daou, Director at Media Mania. The Eclipse HX-Delta brings the high capacity of Clear-Com’s larger matrices to a compact, cost-effective 3RU frame. This smaller frame offers IP or fiber connectivity as well as seamless integration with wireless and third-party devices without external interface frames. The size of the Eclipse HX-Delta makes it well suited for applications where space is limited but advanced connectivity is required, such as with OB trucks and smaller studios. “We are proud of our partnership with Clear-Com through NMK as it builds a complete chemistry of great job results,” he added.